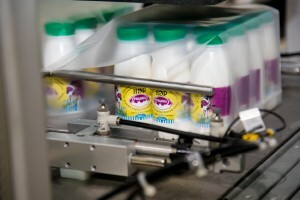 Today, the first batches of "NӘR" functional food product were produced in a package with an improved design at the milk factory of "Agrofirma Rodina" LLP. It is known that the synbiotic "NӘR" is the first functional food product created by NLA researchers, which has a number of unique properties, including increases immunity and promotes active longevity. Thus, the therapeutic efficacy of the product in people with diabetes mellitus, hypertension, obesity / overweight, metabolic syndrome and cardiovascular disease has been clinically proven. "НӘР" is also indispensable in the prevention of oncological diseases, including colorectal cancer. The synbiotic was created at the Laboratory of the Microbiome and Longevity, NLA, headed by Doctor of Medical Sciences Almagul Kushugulova. And this is the first and unique product of Kazakhstani science, which went into industrial production on the domestic food market. This was preceded by the painstaking work of NLA researchers and technologists of "Agrofirma Rodina", who conducted industrial approbation of the developed technology for the production of the synbiotic on the basis of a new technological line. All technological regimes were worked out, measures for interaction of technological personnel were adjusted. After the industrial approbation, there was improved the design of the product packaging in order to make it more practical for consumers. At the launch ceremony there were Ivan Sauer, General Director of the "Agrofirma Rodina", Anuarbek Sultangazin, Chairman of the Board of JSC "Science Foundation" and Zhaxybay Zhumadilov, Chairman of the Board of "University Medical Center", Nazarbayev University, who previously served as the General Director of NLA and he is one of the creators of "NӘR." Today, Institute of Batteries, NU and NLA researchers delivered electric wheelchairs designed to disabled people. Four citizens of Astana were awarded these electrical drives. This project was realized in conjunction and sponsorship of Institute of Batteries, "Zhan Dosym" Fund and Kazyna Capital Management. Professor Zhaxybay Zhumadilov was appointed as the Chairman of the Board of the Corporate fund “University Medical Center”. 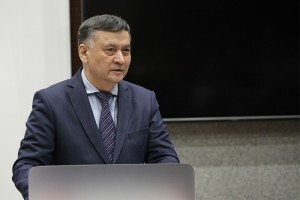 Prior to his appointment, Professor Z. Zhumadilov held the position of General Director of «National Laboratory Astana»PI. Zhaxybay Zhumadilov graduated from Semipalatinsk State Medical Institute. In 1990, he defended his doctoral thesis at the Institute of Surgery named after A. Vishnevskiy MSA USSR, Moscow; in 2004 – Ph.D. in Medical Science in Hiroshima University, Japan. Professor Z. Zhumadilov started his career as a surgeon in the first city hospital in Semipalatinsk. He worked as Head of the Faculty Surgery Department, Pro-Rector of the Semipalatinsk State Medical Institute. In 1999-2004, he worked as a Visiting Professor at Hiroshima University, Japan. From 2004 to 2008, he worked as Pro-Rector on scientific and medical work at the Semipalatinsk State Medical Academy. From 2008 to 2011, Professor Z. Zhumadilov was the Executive Director of JSC “National Medical Holding” (NMH), Astana, and Rector of the JSC “Medical University of Astana”, and Chairman of the Board of Directors of JSC “Medical University Astana”. In January 2011, he headed PI “Center for Life Sciences” at Nazarbayev University. Since September 2015, Professor Z. Zhumadilov has been the General Director of “National Laboratory Astana”, Nazarbayev University. Prof. Z. Zhumadilov is the author of more than 550 scientific works, including 5 monographs and more than 30 inventions. Over 200 of his works were published in English and Japanese. In addition, he was the head of five doctoral and 22 master theses. Z. Zhumadilov is a member of the editorial board of the prestigious American journals “Rejuvenation Research”, “International Journal of Probiotics & Prebiotic”, “Central Asian Journal of Global Health”, and “Gerontology & Geriatrics Research”. In the 1990s, after the collapse of the USSR, Professor Z. Zhumadilov made a great contribution to the development of healthcare in the region. Through international charitable organizations, he attracted medical equipment and medicines for hospitals. In conjunction with the US Cancer Institute, Professor Z. Zhumadilov worked as a Co-Director of the first international project for screening thyroid diseases, and reconstructing radiation doses in the Semipalatinsk region. As part of the activities of the international fund “Ecology, Radiation, Health”, Professor Z. Zhumadilov conducted work on attracting American investors to the Semipalatinsk region. Moreover, he did a lot of work on organizing internships in U.S. and Japanese clinics for doctors and nurses of Semipalatinsk. Professor Z. Zhumadilov was the first in Kazakhstan to start using a fine needle aspiration biopsy method to diagnose nodular thyroid diseases in the regions adjacent to the Semipalatinsk nuclear test site. It was the first time when minimally invasive precision methods for the treatment of nodular thyroid diseases were developed. Together with Japanese scientists, the statuses of thyroid function and iodine deficiency in a number of settlements adjacent to the test site were studied. Z. Zhumadilov made a great contribution to the development of science and public health in Kazakhstan. In particular, he was a founder of Nazarbayev University’s Center for Life Sciences, a center with a modern infrastructure to carry out scientific research in accordance with high international standards. Thanks to the contribution of Z. Zhumadilov, NU has successfully developed partnerships with the world leaders in biomedicine. Under his guidance, the scientific bases of genomic and personalized medicine, bioinformatics, regenerative and translational medicine in Kazakhstan, as well as the concept of development of the modern paradigm of clinical practice, education and science were developed. 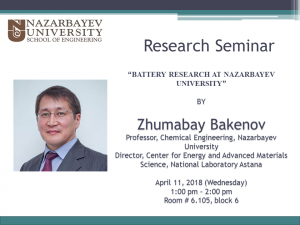 On April 11, Zhumabay Bakenov, Professor, Chemical Engineering, Nazarbayev University; Director, Center for Energy and Advanced Materials Science, National Laboratory Astana will present current projects of his Research Group on preparation and characterization of new materials for next generation rechargeable batteries. Prof. Zhumabay Bakenov is an internationally recognized scientist in fields of materials science, electrochemical engineering, and advanced energy storage system. He was the first faculty of the School of Engineering to arrive in August 2011. Since that time, Prof. Bakenov have pro-actively engaged both in the academic and non-academic life of NU, National, and international programs and organizations. Prof. Bakenov established the largest and successful Research Group at Nazarbayev University, which received a large number of research projects from local and international governmental and industrial funds (EU FP7 Program, World Bank, the Government of Kazakhstan, British Council, National Companies, and international private companies, NU internal funding etc.) with the total requested funding exceeded USD10M. Prof. Bakenov established the first successful startup company at NU, and was the first PI at NU hired international postdocs to his Group. Don’t miss an opportunity to attend an interesting lecture! Date and time: April 11 (Wednesday) at 1:00 pm. ASTANA – Afghan public health workers arrived in the Kazakh capital April 2 for a two-week capacity-building seminar on maternal and child healthcare organised by the Kazakh Ministry of Foreign Affairs in partnership with the United Nations Development Programme (UNDP) and Japan International Cooperation Agency (JICA). The inaugural panel session was attended by top-ranking officials from the Foreign Affairs and Healthcare ministries, UNDP representatives and Japanese and Afghan embassies, reported the foreign ministry press office. The seminar is in line with Kazakhstan’s official development assistance to Afghanistan and is aimed at strengthening maternal and child healthcare in the Central Asian region. More than 80 percent of the participants are women. Afghan health care specialists will become acquainted with the Kazakh healthcare system, focusing on child and maternal health and the organisational structure of prenatal centres. The sessions will include visits to the prenatal care and obstetrics and intensive care departments at the National Research Centre for Maternal and Child Health. Lectures will be dedicated to technological advancements in treating obstetric complications during pregnancy and childbirth and medical support for newborns in rural areas. Minister of Healthcare Yelzhan Birtanov and professors from Nazarbayev University will be among the speakers, with the nation’s leading research university serving as the main base. Transferring Kazakh healthcare experience to Afghan women will be the country’s important contribution to the efforts of the world community to help further develop Afghanistan. Kazakhstan has long been engaged in strengthening Central Asian cooperation and actively supports Afghanistan in developing public life. The first leg of the current programme, capacity building training in government management and education for Afghan government workers and NGO representatives working in the country, was held last July. Twenty-four individuals took part in that programme, gaining experience from their respective Kazakh colleagues. A two-week workshop in maternal and child healthcare for public health professionals from Afghanistan has commenced at Nazarbayev University. The workshop marks an important milestone in the cooperation between the Ministry of Foreign Affairs of the Republic of Kazakhstan and the United Nations Development Programme (UNDP) on capacitating Kazakhstan’s Official Development Assistance (ODA) system within the framework of joint project “Promoting Kazakhstan’s Official Development Assistance Cooperation with Afghanistan”. The project serves the purpose of piloting Kazakhstan’s ODA initiative by developing capacity of Kazakhstan Government in designing and implementing development projects, whilst also expanding economic independence and building capacity of Afghan women. Kazakhstan shares experience and best practices with Afghan counterparts in the area of maternal and child healthcare. Over the course of the workshop the participants will learn from leading experts at Nazarbayev University’s School of Medicine, National Laboratory Astana, and the National Research Center for Maternal and Child Health. The workshop will focus on the affordable and easy ways of maintaining equipment and practices to increase the relevance of knowledge acquired in the course of the workshop, whilst also taking Afghan context into consideration. “Over the past two decades Kazakhstan has accomplished tremendous developmental progress in numerous areas, including maternal and child healthcare. The maternal and child mortality figures saw dramatic improvement due to the dedicated effort of the government and the international community. For example, the country has achieved a two-thirds reduction in the deaths among children under age 5, whilst maternal mortality rate fell from 55 per 100,000 live births in 1990 to 12.6 in 2013. These achievements are evidence of hard work and strategic vision, and we commend Kazakhstan’s willingness to share its knowledge and experience through the official development assistance initiatives,” said UN Resident Coordinator and UNDP Resident Representative Norimasa Shimomura. Kazakhstan is working towards establishing national ODA operator agency (KazAID), which will further professionalize Kazakhstan’s ODA system by ensuring accountability, efficiency and sustainability of Kazakhstan’s development assistance effort. “Kazakhstan is an active and important member of the international community. Earlier this year under Kazakhstan’s Presidency of the UN Security Council, a cornerstone of the agenda was bringing peace and prosperity to Afghanistan. An effective way to do this is by offering development cooperation now that Kazakhstan has joined the ranks of donor countries. Over the past two decades, Kazakhstan has provided significant amount of foreign assistance,” said Norimasa Shimomura. The Deputy Minister of Foreign Affairs of Kazakhstan Roman Vassilenko, the Ambassador of Japan to Kazakhstan H.E. Ichiro Kawabata, the Minister Counselor of the Embassy of the Islamic Republic of Afghanistan to the Republic of Kazakhstan Khayri Mohammad Humayun, General Director of NLA Zhaxybay Zhumadilov and others attended the opening ceremony.